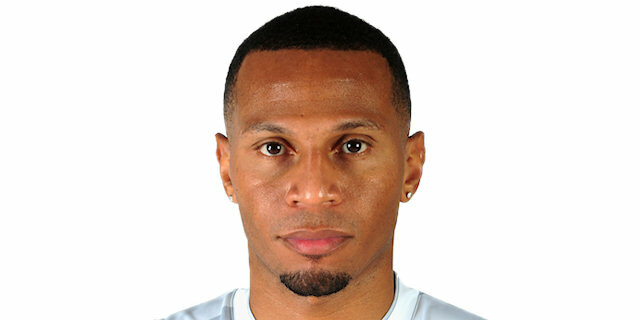 Curtis Jerrells got hot in the fourth quarter to lead EA7 Emporio Armani Milan to a hard-fought 76-69 win over visiting Anadolu Efes Istanbul on Friday night at Mediolanum Forum in the Fashion Capital. The win took Milan ever closer to a playoffs berth. 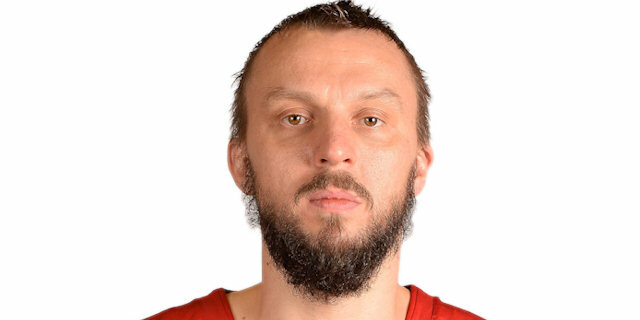 Despite not having the Turkish Airlines Euroleague’s leading scorer Keith Langford in the lineup, Milan found the way to win its fifth straight game, improving to 8-3 and staying in sole possession of second place in Group E. Meanwhile, Efes dropped to 2-9, and lost all mathematical chances to advance. The visitors led for majority of the contest, but never more than 41-48 midway through the third quarter. But Milan rallied back, before Jerrells took over by scoring 11 of his 17 points in the fourth quarter, including three triples and a layup with one minute to go that sealed the deal. 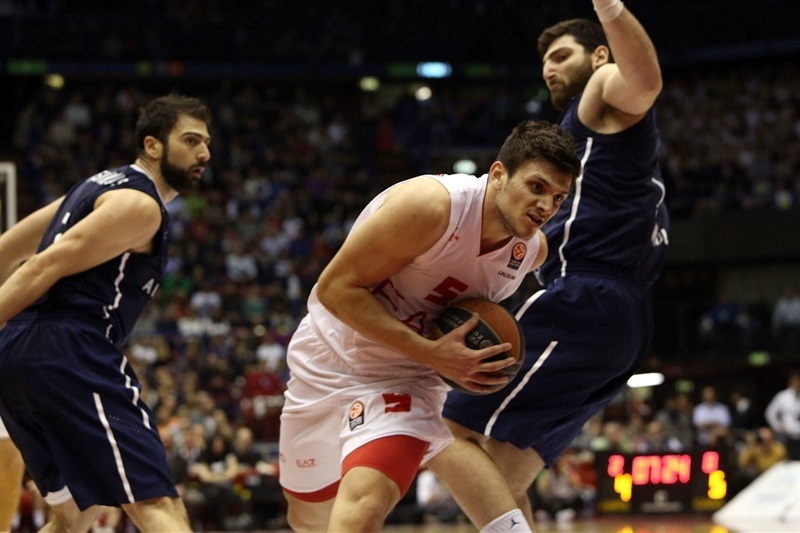 Alessandro Gentile added 15 points for Milan, Samardo Samuels amassed 14 points plus 12 rebounds, while Daniel Hackett and David Moss scored 10 apiece in victory. Milko Bjelica finished with 16 for Efes, while Jamon Gordon had 12 points plus 8 assists, and Kostas Vasileiadis also scored 12 in defeat. 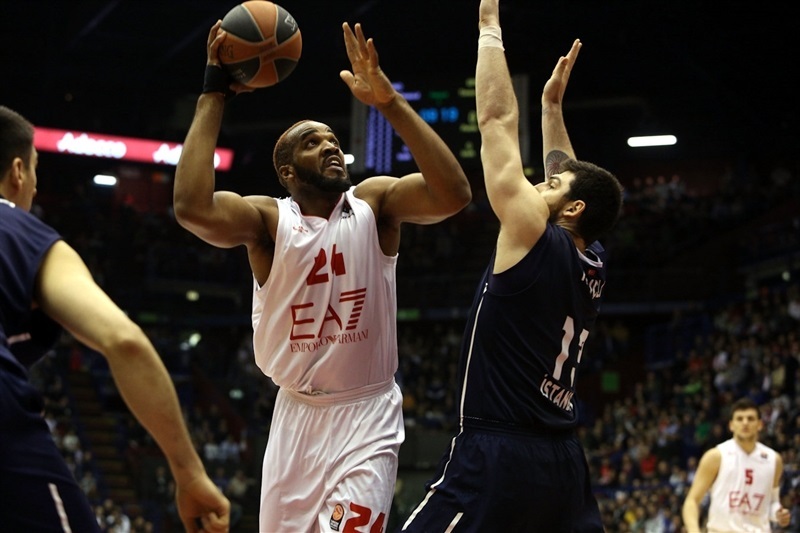 Milan big man Samuels started things off by working his way inside for a bucket and Gordon answered with a fastbreak layup for Efes. After Hackett stole and took off for a reverse layup, Gordon’s drive to the hoop and a put-back from Bjelica made it 5-6. 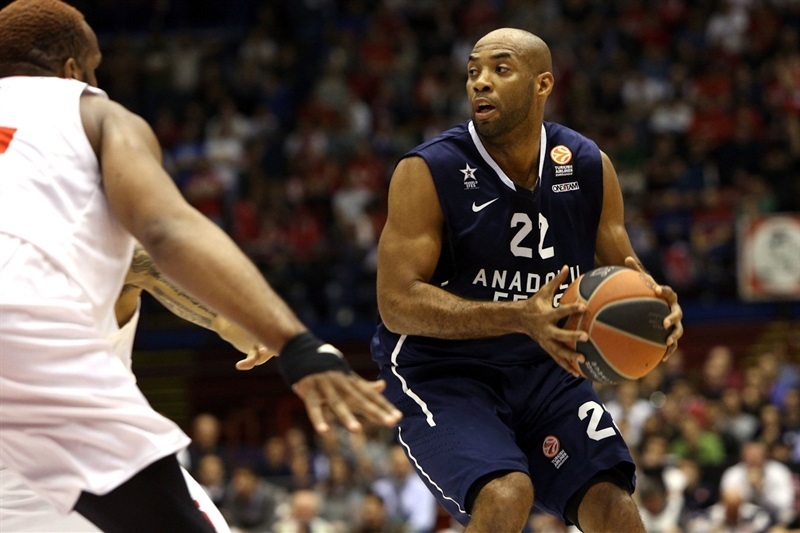 Samuels scored again from close range, and after Bjelica sank 3 of 3 free throws, elevated for a big dunk and a 9-9 tie. 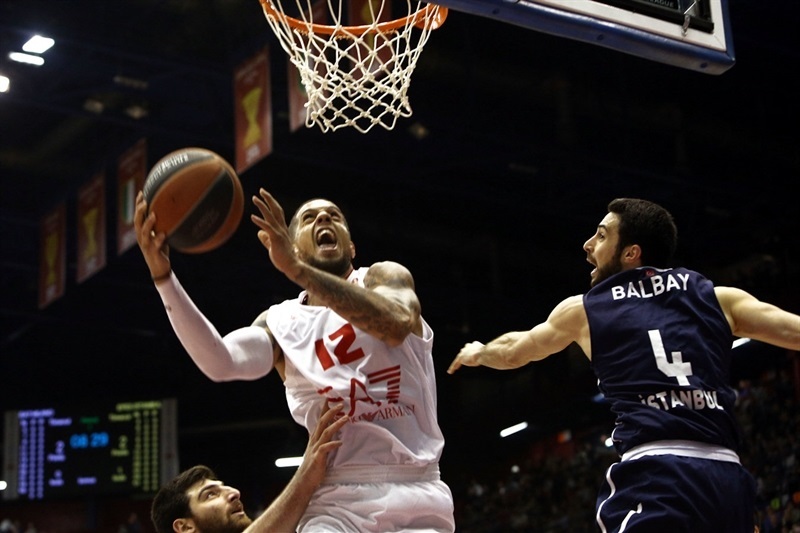 The hosts regained the lead when Gentile buried a jumper, and with Curtis Jerrells driving for a pair of layups Milan went in front 15-10. Gordon snapped an 8-1 Milan run with a floater and then Kostas Vasileiadis hit a mid-range jumper for the visitors. Jerrells added a pair of foul shots to the hosts' tally, but Vasileiadis nailed a three-pointer in the last seconds of the quarter, making it 19-19 after 10 minutes. 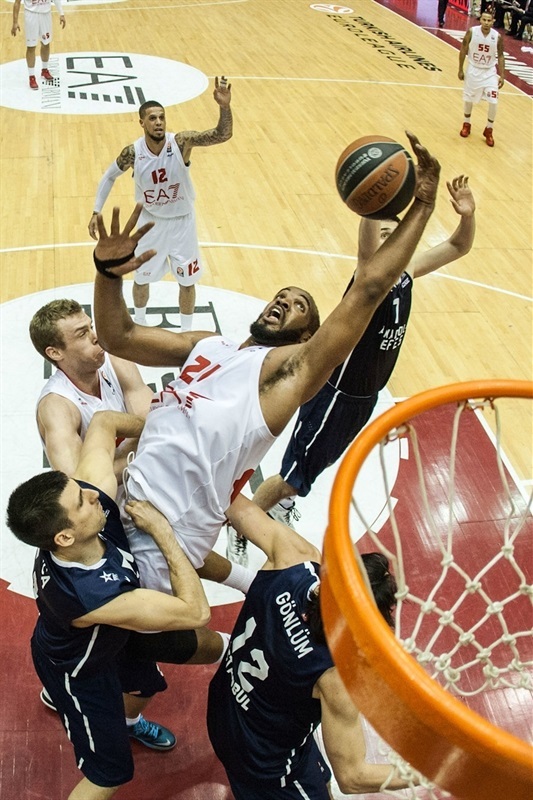 Samuels opened the second quarter in a similar way to the first, but Dusko Savanovic hit a triple and Gordon a short jumper for Efes to go ahead 23-24. After Hackett banked in a shot, Birkan Batuk had a triple and a fastbreak layup to take the visitors in front again, 25-29. 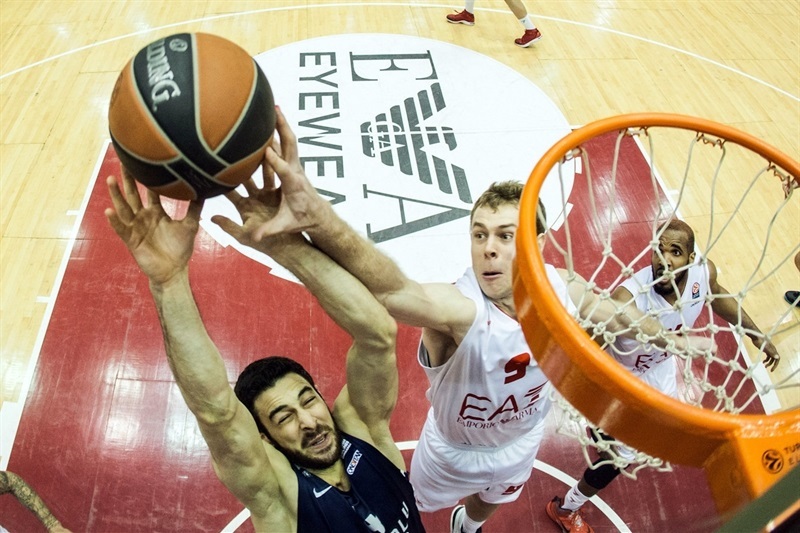 Gonlum added a layup for Efes but soon Gentile hit a fadeaway jumper and drove for a layup, tying the affair at 31-31. Efes re-took the lead with Bjelica scoring a layup on a breakaway, and after Planinic scored a layup of his own, Deniz Kilicli muscled one in through heavy traffic for a 32-37 advantage. In the final minute of the half, Kristjan Kangur nailed a three-pointer, Milan's first of the night, before Planinic and Hackett traded layups, making it 37-39 at halftime. 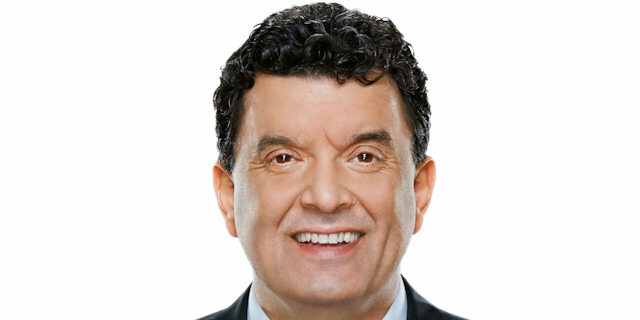 Gentile opened the third quarter with a layup, but Vasileiadis buried a long three, before Gordon added a layup and assist on Kilicli’s layup to make it 39-46. After a Milan timeout, Hackett scored a driving layup, but Batuk answered with a short jumper. 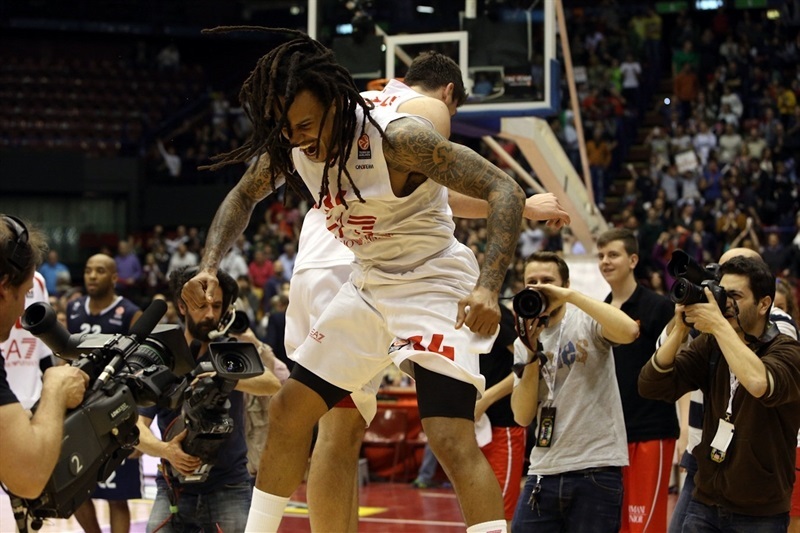 However, Hackett drove for another layup, David Moss hit a corner triple, and after an Efes timeout, Gentile’s fastbreak dunk helped Milan tie the game at 49-49. But Gonlum scored on a short jumper and Bjelica hit a long one for a 49-53 lead. A basket-plus foul from Samuels started the quarter. 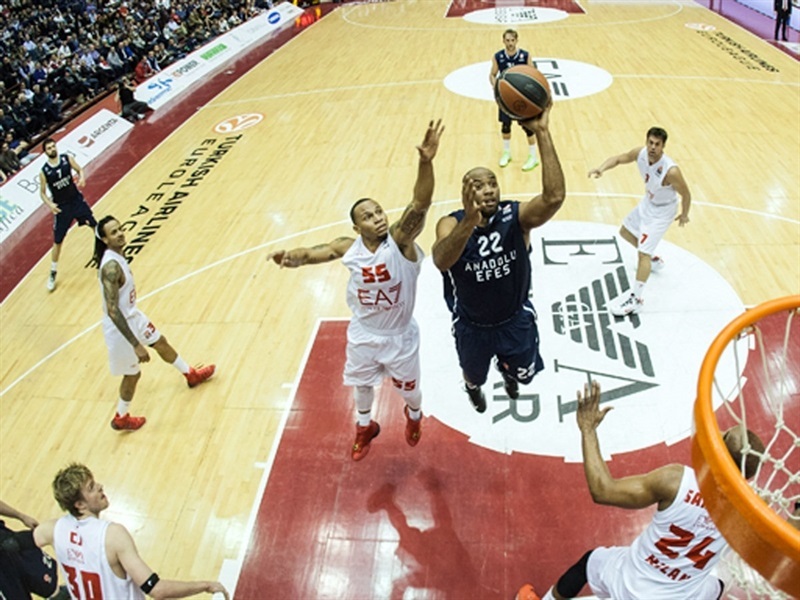 Bjelica kept Efes in front with a three-pointer, but Jerrells sank one from long range to get within 55-57. After Planinic hit a floater, Moss countered with a baseline jumper. Vasileiadis drove for a layup and a 57-61 cushion. 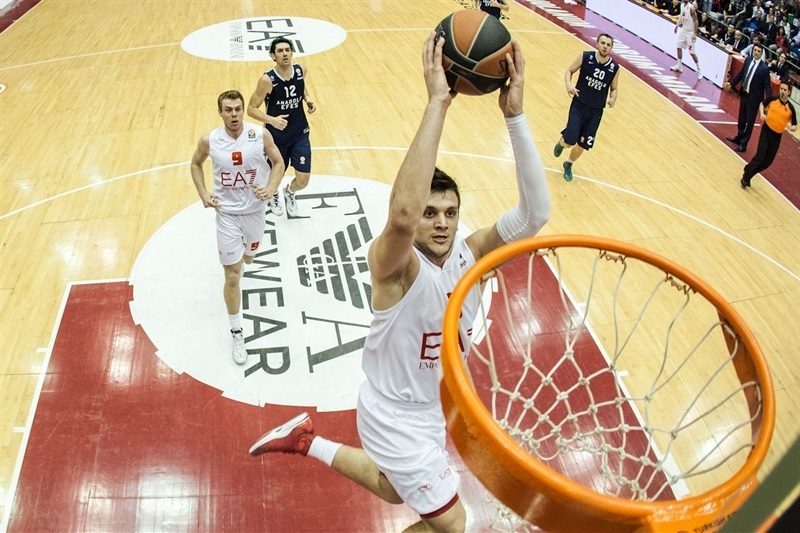 Nicolo Melli battled for a layup on the other end, and Jerrells knocked down a three-pointer to put Milan in front, but Bjelica hit another triple for Efes to regain the lead at 62-64. However, Jerrells stayed hot, hitting a step-back three and then he assisted on a length-of-the-floor pass for Gentile’s fastbreak layup. After a timeout, Moss nailed a corner three-pointer to make it 71-65 and after Gordon scored off the glass, Jerrells drove for a layup with just over a minute to go. Gentile’s monster dunk sealed the deal. "It was a very tough game against a great team. They played a very physical defense, as we expected. I knew that we could not have a great shooting night from downtown, because Efes is one of the better defenses in the competition. It was crucial that my team remained focused and tried to do simple things. I'm proud of my team team and its performance. We know our limits and we worked well trying to hide them. It's a very important success, for both technical and work-ethic reasons, and we have to continue in this way." "First of all I want to congratulate EA7. I have to say that we tried to winthe game, and we led it for three quarters, often with a good margin of advantage, but in the last ten minutes we lost energy. Their defense changed and they improved their three-point shooting percentage, and this is the reason for their victory. We did our best and I want to congratulate my players." 'We knew we had to play hard, but we struggled early on. We needed to improve our defense. We kept going on and after the break we played better on both sides. I talked with Langford during the intermission, he told me to shoot and take risks. I did it, I scored and we won. We needed to be more aggressive on offense to win the game, and we did it. We're know each other better, we're playing together. We need to go forward looking game-by-game, day-by-day, but if we continue to be aggressive, we can advance." "We have a bad record, but we always try to play the best that is possible. And tonight we played very well for the first 30 minutes, but in the last quarter we were very tired and without energy. 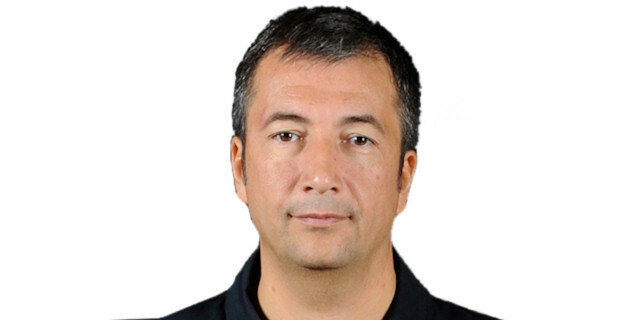 Milan also increased its intensity and defense and put us in trouble. To play in Milan, one of my favorite places to play, gave us extra motivation because the Final Four will take place on this court, but in the end we did not manage our offense well and made too many turnovers that left them easy breaks."